You are here: Home / Giveaways / Silhouette Portrait GIVEAWAY! You guys! I can’t tell you how long I’ve been waiting to do this post! I’ve watched other blogs do giveaway after giveaway while I sat in a corner like a wall flower at a school dance, hoping and praying I’d get picked. Well, maybe not quite that dramatic but STILL! I really REALLY wanted to do one and my day has finally come!!! Woo to the HOO! We all know that next week is Thanksgiving AND the biggest shopping day of the year – Black Friday. Silhouette is having a BIG, no HUGE promotion come Black Friday and dude, it’s going to be their biggest one yet. I can’t divulge the juicy details until then but you have a chance NOW to win a Silhouette Portrait! The Silhouette Portrait is an electronic cutting tool perfect for any of your craft projects. This die-cutting machine uses a small blade to cut paper, cardstock, vinyl, fabric and more. Giveaway is for US Residents ONLY. Good luck!! Winner will be announced November 28 along with all of the JUICY details for the Black Friday promotion. I want to make some personalized Christmas ornaments. I would make Holiday decorations and gift boxes. I have been seeing so many Silhouette tutorials lately and I really, really want to make some of them! Fingers and toes crossed! Christmas shirts for my kids....then Christmas vinyl print for a window waiting to be used.....then Christmas present tags. I've got a lot to do!!!! Oh the gorgeous things I could make! I would personalize inexpensive items to jazz them up for gift-giving all year round. I have a monogramming and heat press shop, and would LOVE to use this to cut my designs with. It would make my life so much easier!! I would love to make some holiday happies for my friends & family! I would make some Christmas wall decor. I will make one of those subway signs with vinyl! After seeing all the cool Silhouette projects on Pinterest I've come to the conclusion that I need one! vinyl typography signs of all kinds... maybe an army of them. I'd love to win one of these for making lots of vinyl projects!! I would do some appliqué shirts for my kids. 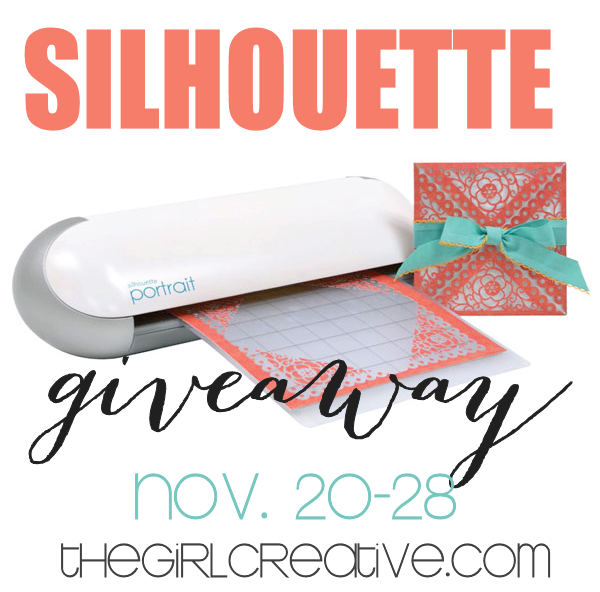 And I know what you mean I would love to do a Silhouette giveaway too! Well I have a Cameo already...so I would definitely be giving this one as a gift!! Wahoo! I would make Christmas Pajamas for the kids! I would make Christmas decorations! I have wanted one of these pretty much FOREVER. I think the first project I'd do right now is some cute diecuts for plaques in our new baby's nursery. I would make subway art for my family room. I would make Christmas gifts for my family! I would finally put all those beautiful pics of my kids in an album and embellish them with a the "cutesies" they deserve! Woohoo! This is so exciting! I've wanted a silhouette for SO long. If i win, I would use this for gift decorating for the holidays! The first thing I would make with a new Silhouette would be holiday ornaments for my University of Alabama themed Christmas tree! I would love a Cameo. All the fun things I could make....Oh my goodness. The creativity may never stop. Thanks for the chance to win one. my list is so long of things i would love to make!!!! I want to make christmas countdown blocks!! I will make an advent calendar for my kids! There are so many things I would love to make! I have no idea what I'd do first. I've been wanting one for so long I'd probably just sit and cry for a day from sheer joy and then start playing with the free cut files I've been collecting. Some banner signs for each holiday! I think I'd start with some ornaments! My first project would be to create a pretty arbor/wreath that looks like doilies to put over my two daugthers' vintage twin bedsteads. Fingers crossed! If I win, I plan on giving the Silhouette to my mother for Christmas. She got another cutting machine and barely uses it because she is so disappointed with how it functions. I really want to make my own gift tags this year and I know the Portrait would be awesome for it! I would probably make some cute Christmas decor! I've wanted a Silhouette forever. I'd love to win! Thanks for the awesome giveaway!! I would love to win this for using while scrapbooking.. I want to make a super cute holiday banner to hang in my house!! Oh how fun! Signs - lots of signs - I have so many ideas. I would cut letters from fabric and make banners! What an awesome giveaway! If I was lucky enough to win, I think the first thing I would make with my new silhouette portrait is a Christmas card or two! Thanks for a chance to win! I would make a sign. I would make some Christmas ornament I saw on a friends blog for a giveaway on my facebook fan page!!! Very exciting! I'd love to try out a Silhouette! I would love to cut some vinyl to make some awesome signs and also make some Christmas cards. I would create Monogramed pictures for my family for Christmas. I would LOVE LOVE LOVE to have a Portrait. I have a cameo and would love to have one of these too !! I would make some HTV shirts!!!! <3 Thanks for the opportunity! I would make LOADS of Christmas pillows!!! I would love to win and see so many things I want to make! I'd love to try some glass etching! I'd like to make some homemade cards. I would LOVE one to make homemade Christmas presents! I'd make some fun Christmas Advent Calendar cut-outs! a wall quote for my mom's new house. I'd love to use a silhouette to do some projects for my wedding next month! I would make a chore chart for my grandson. I would make a scrapbook layout. I would work on applique patterns for sewing! I would make some vinyl cutouts to use with my etching projects. Congratulations on getting picked to do a giveaway! Yay! I would make some vinyl wall art. First would be Christmas cards! I would make vinyl wall art. I think I would make Christmas cards! If I won, I would make some cute little Christmas ornaments. The possibilities with a Silhouette are endless (!) but I would probably make Christmas cards first. I'd make an Advent calendar. I'd make labels for my spice jars and pantry! My very first project will be to make a couple hundred vinyl decals for a couple hundred people to use on their cars. It's a labor of love. I'm a teacher and so I 'm sure we would get busy making gifts for our parents. I would make some etched glass storage jars! I have alot of Christmas crafting to do. Thanks for the chance to win. I'll be making Chrismtas gifts with glass etching. There is so many things that I want to try with a Cameo...from vinyl to glitter pages and fabric cutouts. Give me the Cameo and I will make you proud! I would love to be able to cut designs for my grand children's school. We have a small school with limited resources so my family helps out in any way we can. I love to help the children create crafts they can be proud of and with this quality machine they would be very successful in their projects. Thank you very much for this give away! Would love to use this for shirts and some glass etching! I would like to do the glass etching to put on my picture frames. I've seen awesome HTV pillows on pinterest I would love to make! I would love to make pretty appliques for my niece's clothes. I would add a fancy label to EVERYTHING! Oooh! I'd love to win a silhouette!!! I'd make an advent calendar and then some Christmas gifts. Thanks for the giveaway! I would love to make some vinyl signs for my home! Maybe something for the bathroom mirror and for the kitchen! I would make Valentine Day cards! I would make each of my Grand children an awesome gift !! Thank you for hosting this give away. I would start making some new Christmas decorations! I would love to make some ornaments for the grandparents. Mother of 5 ... $$$$ 4 Grils that are always want something else.. I havemade just about everything they have asked for.. Until now. This would be a big fix for the newest craft adventure with them.. Even my son is ready to help. BIGGEST Smile.. I would make a batman logo for the batman cape I am making for my son. I would label my Life...Get everything organized!! Merry Christmas to ME! Something with fashion - appliques I think! I would make so many things with this. A onesie or room decor! I would love to use on my sb pages. Love ur blog. Thanks for the chance to win! I've been drooling over this machine for a while now. I would make some personalized holiday gifts for friends and family. I would make a pallet family quote first then go crazy with wall quotes all over the house. I would definitely make a personalized ornament for my 3 year old niece's 1st Christmas Tree! MY SISTER-IN-LAW AND I WERE JUST TALKING ABOUT ALL THE CHRISTMAS PRESENTS WE COULD MAKE! Thanks for the chance to win - I'd love to make some gifts for our teachers. I would love to make some custom onesies! I will make some festive holiday decor! I'd make a wooden vinyl Christmas sign! i love your site, It is new to me. I would make some etched glass gifts and then the list is very long. I would make pallet art for CHRISTmas gifts! I would also share it with my sister in law. S he is a teacher and would get lots of use from it.Thank you for hosting this giveaway! I would love to win to able to gift it to my aunt. I know she could really use this with holidays coming and with her new job. Thanks for the chance. there would be so many things I would do with it...so many projects. first one up would be a wall design with christmas words instead of using a printable. The first project that I would do is to make a decal saying "the best times in my life" with pictures of my three daughters and clocks showing the times that each one was born! If I win a silhouette, I have a whole Pin board full of projects I've been wanting to do. But first, I would make the rainbow connection canvas I've seen going around Pinterest. You can see it here: http://www.pinterest.com/pin/284641638921860836/ The song holds special meaning for my husband and I know he would love to have that hanging in our home somewhere! First thing I would make is appliques for the Grand daughters Dresses!!! Love to sew and this will be a plus for me. I will make gift tags or cards. I would love to make christmas ornaments. This would be an awesome early Christmas present! I'd make a vinyl decal for my mixer. I want to make a chalkboard menu planner which will be my Christmas gift to my sister!! I think I would make about a million holiday cards for everyone! Complete rookie, so I'd start with some simple cards. I would create some Christmas ornaments for my family members. I would love to make some iron-on vinyl t-shirts for the family along with many other projects! Thanks! I have TONS of new decorating ideas for my new home this year. I have one big hug blank slate that needs lots of love :) Thanks for this!!! There are sooo many things but probably some Christmas decorations. First project? A Thank You card :) Happy Holidays ! The first thing that I would create would be a snowflake banner to hang in my home. I sure hope I win a giveaway for one of these!! :) Thanks!! I would love to start on Christmas gifts for friends and family! I would start by making funny Christmas plaques for my friends, and a nameplate for my desk at work. I will cut fabric with it for a Christmas wall hanging, thanks! I would like to make Christmas cards. I would love to make some rubber Christmas stamps! The first thing I will make... I will make Christmas candy boxes for the kids at school! I want to label everything in my house. I would do art on canvas. I'm not sure where I'd begin!! ;) I love personalization, so I would definitely find something to work on! I would like to give it as a gift to my daughter for scrapbooking her college years. I would love to have this in time to make vinyl labels for the pickles and spice mixes I give to family and friends for the holidays! Thanks for the giveaway!! I have so many things I want to create with the Silhouette. I need some wall art for my Living room. I would make vinyl signs! love them! I LOVE EVERYTHING VINYL AND WOULD LOVE TO OWN THE SILHOUETTE FOR MY VERY OWN!! THANK YOU SO MUCH FOR BRINGING SUCH GREAT IDEAS TO ALL OF US WHO DO CRAFTS! I love everything vinyl and would love to own the Silhouette for my very own! Thank you so much for bringing us such great ideas to all of us who do crafts! A holiday banner. Thanks for the giveaway! I'd make some super cool christmas decoration decals. Stencils for cookies and cakes! If I won, I'd attempt to make my wedding invitations first! The first thing I would make If I won this wonderful machine would be Vinyl Wall Art! Then labels, paper cutting designs, paper art, etc! *praying I win* Thanks for this chance! Blessings! I want to make some ornaments!